In my last post, I was stalled by indecision of how to proceed in making a 1920s day dress. I had a 1921 McCall’s pattern and a 1920s hat. But did my authentic vintage pattern look “20s enough” with its straight skirt rather than the pleats or flounces I associate with the decade? I booked my tickets to the Jazz Age Lawn party, and excitedly (and somewhat nervously) wondered what to sew. My imaginings for making the 20s dress took me through hundreds of google images and e-bay listings of 20s dresses and 1920s pattern catalogues. I noticed how the hemlines rose and fell during the decade. I observed accessories and that the iconic 20s cloche was not the only hat style of the time. And despite e-bay listings that combine two decades with “20s/30s dress,” I could clearly see the rather dramatic shift from Twenties’ loose pull-over-the-head dresses to Thirties’ highly fitted dresses (enabled by a new trend of using zippers in dresses). I also learned more about my favorite fashion decade, the 1960s. I knew that Sixties’ styles were influenced by a 1920s revival, but looking through the Twenties designs I was still a bit surprised by how closely the two decades relate – simply take a Sixties drop-waist scooter dress, leave out the darts and make it out of a light, floaty fabric, and you have a 1920s flapper look. 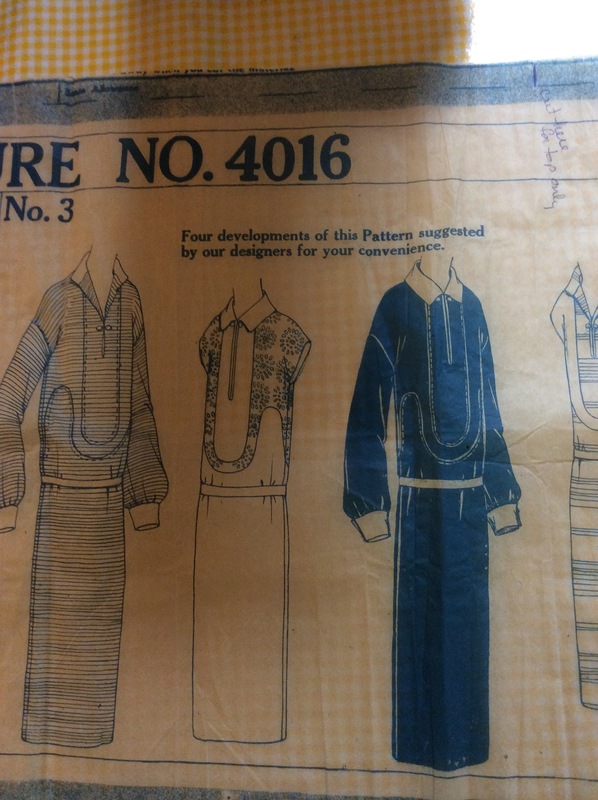 I contemplated working with one of my 1960s patterns instead. Yet in the end, I sewed my 1921 McCalls pattern rather than a Sixties-does-Twenties flapper dress. 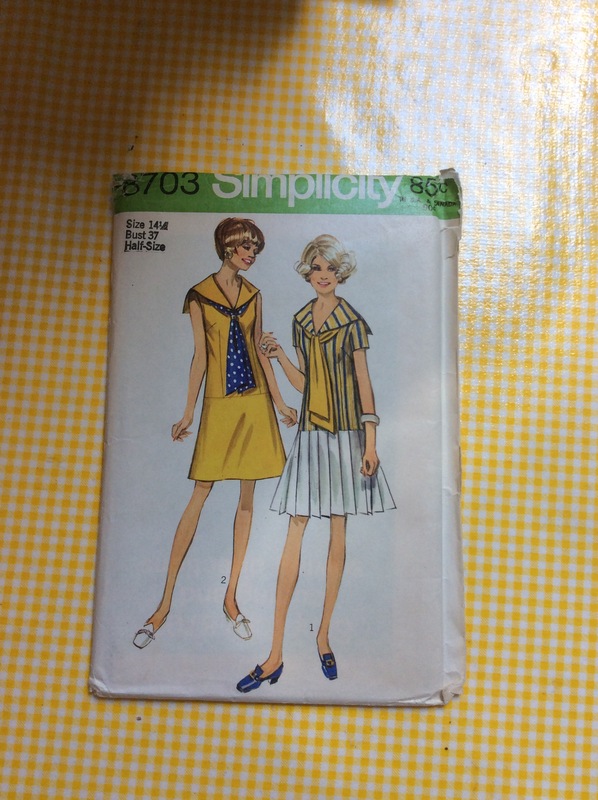 I even kept the straight skirt design of the original pattern. However, beyond that, making the entire 20s lawn party look was an exercise in “Twenties-ish” improvisation. In sewing the dress pattern, I drew on imagery from different years within the decade rather than hewing strictly to 1921. I lowered the skirt hem below the knee. Below-the-knee skirts were in style in 1924, so it was as if I was a 1920s seamstress who procrastinated three years to make her dress, and altered the hem accordingly. I added a pocket to fill out the deco curve. And I made a two-piece dress (a top and matching skirt) rather than a one-piece. While I did see a few matching tops and skirts in my 20s image search, they seemed like exceptions. 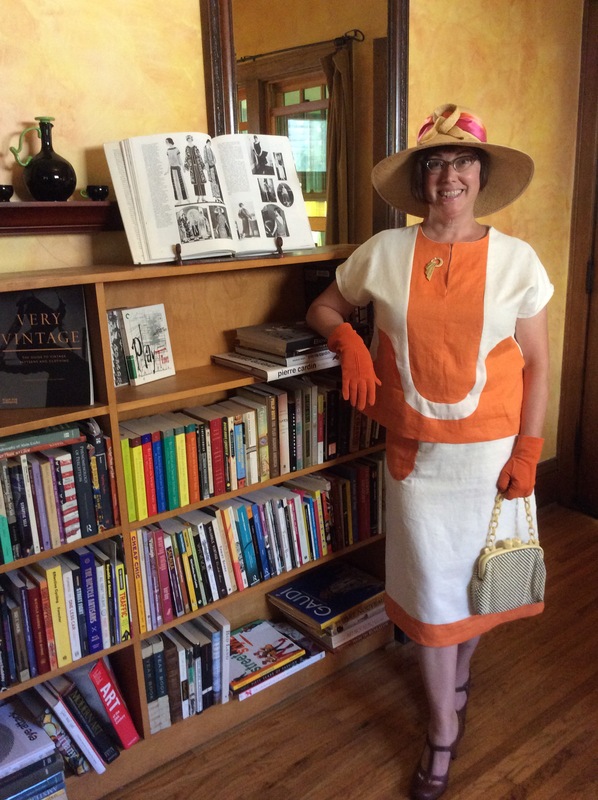 That decision was an example of how the needs of the present shape how we represent the past – I need clothes I can mix and match rather than a 1920s dress that can only be worn to costume events, and the two-piece style gives me that option. In terms of accessories, I went with a wide-brimmed straw hat rather than my authentic velvet brown 20s cloche, which seemed too heavy for August. In completing the look, I simply thought “Art Deco.” I associate my Whiting & Davis white mesh bag as deco style, but according to the label and the Vintage Fashion Guild, it’s a 1940s, not a 1920s. The bag matches a deco celluloid-and-rhinestone pin, and the pin in turn matches the straw decoration on the hat. Are they 20s? I don’t know. The t-strap shoes are four or five years old but look 20s-ish. The orange gloves? Who knows? And I don’t have an option other than my 1950s/1960s cat-eye glasses. I like the vintage look of the whole ensemble, but it’s not authentically 1920s. Will it pass as Twenties? We’ll see. Thanks! It was a fun outfit to think about putting together.